Trawick Travel Safe Travels International Travel insurance plan is one of our favorite travel insurance plans with a decent lost baggage benefit. Good Neighbor Insurance provides an array of travel insurance plans to fit each of our guests, you! But with the Trawick Travel Safe Travel International Travel insurance benefits you may add the optional enhanced baggage benefit of 3,500USD. Please click the most up-to-date brochure that shares all the great benefits this Trawick travel insurance plan provides at https://www.gninsurance.com/trawick-safe-travels-international-travel-insurance/. Only $300 total for all electronics. If client is looking to cover laptop and cameras, etc, the most payout will be $300. The upgraded coverage will pay up to $300 for lost/stolen/damaged electronics while in the insured’s care. tablet PC’s, computers, iPods, CD players and personal music and stereo equipment, CD’s, computers, computer games and associated equipment, hearing aids, telescopes and binoculars, antiques, jewelry, watches, furs, and articles made of or containing gold, silver or other precious metals or animal skins or hides. Any item of value to be evaluated on a case by case basis. Good Neighbor Insurance also has put together a FAQ (frequently asked questions and answers) relating to baggage coverage as well as the enhanced baggage benefit. You may view this at https://www.gninsurance.com/trawick-safe-travels-international-travel-insurance/concerning-trawick-safe-travels-international-usa-baggageenhanced-baggage-benefit/. This baggage benefit is also one our other Trawick Trip Cancellation Insurance. You may view these benefits and all of the benefits on this trip cancellation short term plan at https://www.gninsurance.com/trawick-trip-cancellation-insurance-traveling-outside-u-s/. Good Neighbor Insurance international brokerage firm has been in business since 1997. 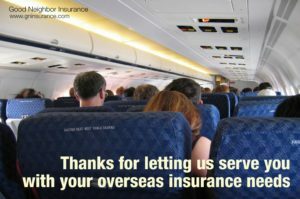 We provide a vast array of benefits for any type of traveler requesting international medical cover as well as other specific overseas cover. For more information please go to our corporate web site at https://www.gninsurance.com/ or call our toll free number here in the U.S. at 866-636-9100. You may also reach us on our Arizona work number at 480-633-9500 or email us at info@gninsurance.com. Our trained international insurance agents are here to answer any of your questions and to find the best solution for your international medical cover. Thank you for allowing us to serve you, as you enjoy your travels outside the U.S.